"Element 115" redirects here. For fictional and conspiracy references to element 115, see Materials science in science fiction. Moscovium is a synthetic chemical element with symbol Mc and atomic number 115. It was first synthesized in 2003 by a joint team of Russian and American scientists at the Joint Institute for Nuclear Research (JINR) in Dubna, Russia. In December 2015, it was recognized as one of four new elements by the Joint Working Party of international scientific bodies IUPAC and IUPAP. On 28 November 2016, it was officially named after the Moscow Oblast, in which the JINR is situated. Moscovium is an extremely radioactive element: its most stable known isotope, moscovium-290, has a half-life of only 0.65 seconds. In the periodic table, it is a p-block transactinide element. It is a member of the 7th period and is placed in group 15 as the heaviest pnictogen, although it has not been confirmed to behave as a heavier homologue of the pnictogen bismuth. Moscovium is calculated to have some properties similar to its lighter homologues, nitrogen, phosphorus, arsenic, antimony, and bismuth, and to be a post-transition metal, although it should also show several major differences from them. In particular, moscovium should also have significant similarities to thallium, as both have one rather loosely bound electron outside a quasi-closed shell. About 100 atoms of moscovium have been observed to date, all of which have been shown to have mass numbers from 287 to 290. 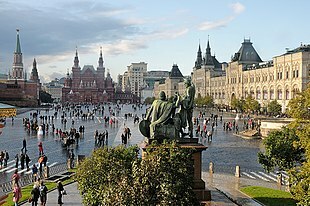 A view of the famous Red Square in Moscow. The region around the city was honored by the discoverers as "the ancient Russian land that is the home of the Joint Institute for Nuclear Research" and became the namesake of moscovium. The first successful synthesis of moscovium was by a joint team of Russian and American scientists in August 2003 at the Joint Institute for Nuclear Research (JINR) in Dubna, Russia. Headed by Russian nuclear physicist Yuri Oganessian, the team included American scientists of the Lawrence Livermore National Laboratory. The researchers on February 2, 2004, stated in Physical Review C that they bombarded americium-243 with calcium-48 ions to produce four atoms of moscovium. These atoms decayed by emission of alpha-particles to nihonium in about 100 milliseconds. The Dubna–Livermore collaboration strengthened their claim to the discoveries of moscovium and nihonium by conducting chemical experiments on the final decay product 268Db. None of the nuclides in this decay chain were previously known, so existing experimental data was not available to support their claim. In June 2004 and December 2005, the presence of a dubnium isotope was confirmed by extracting the final decay products, measuring spontaneous fission (SF) activities and using chemical identification techniques to confirm that they behave like a group 5 element (as dubnium is known to be in group 5 of the periodic table). Both the half-life and the decay mode were confirmed for the proposed 268Db, lending support to the assignment of the parent nucleus to moscovium. However, in 2011, the IUPAC/IUPAP Joint Working Party (JWP) did not recognize the two elements as having been discovered, because current theory could not distinguish the chemical properties of group 4 and group 5 elements with sufficient confidence. Furthermore, the decay properties of all the nuclei in the decay chain of moscovium had not been previously characterized before the Dubna experiments, a situation which the JWP generally considers "troublesome, but not necessarily exclusive". Two heavier isotopes of moscovium, 289Mc and 290Mc, were discovered in 2009–2010 as daughters of the tennessine isotopes 293Ts and 294Ts; the isotope 289Mc was later also synthesized directly and confirmed to have the same properties as found in the tennessine experiments. The JINR also had plans to study lighter isotopes of moscovium in 2017 by replacing the americium-243 target with the lighter isotope americium-241. The 48Ca+243Am reaction producing moscovium is planned to be the first experiment done at the new SHE Factory in 2018 at Dubna to test the systems in preparation for attempts at synthesising elements 119 and 120. In 2011, the Joint Working Party of international scientific bodies International Union of Pure and Applied Chemistry (IUPAC) and International Union of Pure and Applied Physics (IUPAP) evaluated the 2004 and 2007 Dubna experiments, and concluded that they did not meet the criteria for discovery. Another evaluation of more recent experiments took place within the next few years, and a claim to the discovery of moscovium was again put forward by Dubna. In August 2013, a team of researchers at Lund University and at the Gesellschaft für Schwerionenforschung (GSI) in Darmstadt, Germany announced they had repeated the 2004 experiment, confirming Dubna's findings. Simultaneously, the 2004 experiment had been repeated at Dubna, now additionally also creating the isotope 289Mc that could serve as a cross-bombardment for confirming the discovery of the tennessine isotope 293Ts in 2010. Further confirmation was published by the team at the Lawrence Berkeley National Laboratory in 2015. In December 2015, the IUPAC/IUPAP Joint Working Party recognized the element's discovery and assigned the priority to the Dubna-Livermore collaboration of 2009–2010, giving them the right to suggest a permanent name for it. While they did not recognise the experiments synthesising 287Mc and 288Mc as persuasive due to the lack of a convincing identification of atomic number via cross-reactions, they recognised the 293Ts experiments as persuasive because its daughter 289Mc had been produced independently and found to exhibit the same properties. A 2016 study from Lund University and the GSI nevertheless cast some doubt on the syntheses of moscovium and tennessine after the IUPAC/IUPAP Joint Working Party recognized these elements as having been discovered in 2009–2010. It found that the decay chains assigned to the isotopes 287Mc and 288Mc were probably internally consistent, with the uncertainty due to the probable insensitivity of the measurements to very short and very long nuclide lifetimes, incorrect assignments of other decay chains from the 243Am+48Ca reaction to different moscovium isotopes, or uncertainty in the identification of some of the daughters of these moscovium isotopes. On the other hand, the decay chains assigned to 289Mc, the isotope instrumental in the official confirmation of the synthesis of moscovium and tennessine, were found not to be internally consistent. Some subsets of these chains were found to be consistent, suggesting however that their true assignment was to 288Mc, and that their shortness indicated instead new spontaneous fission branches in its daughters 284Nh and 280Rg – or, more likely, undetected electron capture branches in these daughters leading to the even–even nuclides 284Cn and 280Ds, which have a very low barrier to spontaneous fission. While the 294Ts decay chains were found to be congruent, the 293Ts decay chains approved by the JWP were found to probably not be so and require splitting into individual data sets assigned to different tennessine isotopes. It was also found that the set of chains from 293Ts and 289Mc were not congruent. The multiplicity of states found when nuclides that are not even–even undergo alpha decay is not unexpected and contributes to the lack of clarity in the cross-reactions. This study criticised the IUPAC/IUPAP JWP report for overlooking subtleties associated with this issue, and noted that the fact that the only argument for the acceptance of the discoveries of moscovium and tennessine was an almost certainly non-existent link was "problematic". On 8 June 2017, two members of the Dubna team published a journal article answering these criticisms, analysing their data on the nuclides 293Ts and 289Mc with widely accepted statistical methods, noted that the 2016 studies indicating non-congruence produced problematic results when applied to radioactive decay: they excluded from the 90% confidence interval both average and extreme decay times, and the decay chains that would be excluded from the 90% confidence interval they chose were more probable to be observed than those that would be included. The 2017 reanalysis concluded that the observed decay chains of 293Ts and 289Mc were consistent with the assumption that only one nuclide was present at each step of the chain, although it would be desirable to be able to directly measure the mass number of the originating nucleus of each chain as well as the excitation function of the 243Am+48Ca reaction. Using Mendeleev's nomenclature for unnamed and undiscovered elements, moscovium is sometimes known as eka-bismuth. In 1979 IUPAC recommended that the placeholder systematic element name ununpentium (with the corresponding symbol of Uup) be used until the discovery of the element is confirmed and a permanent name is decided. Although widely used in the chemical community on all levels, from chemistry classrooms to advanced textbooks, the recommendations were mostly ignored among scientists in the field, who called it "element 115", with the symbol of E115, (115) or even simply 115. On 30 December 2015, discovery of the element was recognized by the International Union of Pure and Applied Chemistry (IUPAC). According to IUPAC recommendations, the discoverer(s) of a new element has the right to suggest a name. A suggested name was langevinium, after Paul Langevin. Later, the Dubna team mentioned the name moscovium several times as one among many possibilities, referring to the Moscow Oblast where Dubna is located. In June 2016, IUPAC endorsed the latter proposal to be formally accepted by the end of the year, which it was on 28 November 2016. The naming made Russia one of two countries with an element named after both itself and its capital. The naming ceremony for moscovium, tennessine, and oganesson was held on 2 March 2017 at the Russian Academy of Sciences in Moscow. The expected location of the island of stability. The dotted line is the line of beta stability. Moscovium is expected to be in the middle of an island of stability centered on copernicium (element 112) and flerovium (element 114): the reasons for the presence of this island, however, are still not well understood. Due to the expected high fission barriers, any nucleus within this island of stability exclusively decays by alpha decay and perhaps some electron capture and beta decay. Although the known isotopes of moscovium do not actually have enough neutrons to be on the island of stability, they can be seen to approach the island as in general, the heavier isotopes are the longer-lived ones. The hypothetical isotope 291Mc is an especially interesting case as it has only one neutron more than the heaviest known moscovium isotope, 290Mc. It could plausibly be synthesized as the daughter of 295Ts, which in turn could be made from the reaction 249Bk(48Ca,2n)295Ts. Calculations show that it may have a significant electron capture or positron emission decay mode in addition to alpha decaying and also have a relatively long half-life of several seconds. This would produce 291Fl, 291Nh, and finally 291Cn which is expected to be in the middle of the island of stability and have a half-life of about 1200 years, affording the most likely hope of reaching the middle of the island using current technology. Possible drawbacks are that the cross section of the production reaction of 295Ts is expected to be low and the decay properties of superheavy nuclei this close to the line of beta stability are largely unexplored. 3/2. These effects cause moscovium's chemistry to be somewhat different from that of its lighter congeners. The valence electrons of moscovium fall into three subshells: 7s (two electrons), 7p1/2 (two electrons), and 7p3/2 (one electron). The first two of these are relativistically stabilized and hence behave as inert pairs, while the last is relativistically destabilized and can easily participate in chemistry. (The 6d electrons are not destabilized enough to participate chemically, although this may still be possible in the two previous elements nihonium and flerovium.) Thus, the +1 oxidation state should be favored, like Tl+, and consistent with this the first ionization potential of moscovium should be around 5.58 eV, continuing the trend towards lower ionization potentials down the pnictogens. Moscovium and nihonium both have one electron outside a quasi-closed shell configuration that can be delocalized in the metallic state: thus they should have similar melting and boiling points (both melting around 400 °C and boiling around 1100 °C) due to the strength of their metallic bonds being similar. Additionally, the predicted ionization potential, ionic radius (1.5 Å for Mc+; 1.0 Å for Mc3+), and polarizability of Mc+ are expected to be more similar to Tl+ than its true congener Bi3+. Moscovium should be a dense metal due to its high atomic weight, with a density around 13.5 g/cm3. The electron of the hydrogen-like moscovium atom (oxidized so that it only has one electron, Mc114+) is expected to move so fast that it has a mass 1.82 times that of a stationary electron, due to relativistic effects. For comparison, the figures for hydrogen-like bismuth and antimony are expected to be 1.25 and 1.077 respectively. Moscovium is predicted to be the third member of the 7p series of chemical elements and the heaviest member of group 15 in the periodic table, below bismuth. Unlike the two previous 7p elements, moscovium is expected to be a good homologue of its lighter congener, in this case bismuth. In this group, each member is known to portray the group oxidation state of +5 but with differing stability. For nitrogen, the +5 state is mostly a formal explanation of molecules like N2O5: it is very difficult to have five covalent bonds to nitrogen due to the inability of the small nitrogen atom to accommodate five ligands. The +5 state is well represented for the essentially non-relativistic typical pnictogens phosphorus, arsenic, and antimony. However, for bismuth it becomes rare due to the relativistic stabilization of the 6s orbitals known as the inert pair effect, so that the 6s electrons are reluctant to bond chemically. It is expected that moscovium will have an inert pair effect for both the 7s and the 7p1/2 electrons, as the binding energy of the lone 7p3/2 electron is noticeably lower than that of the 7p1/2 electrons. Nitrogen(I) and bismuth(I) are known but rare and moscovium(I) is likely to show some unique properties, probably behaving more like thallium(I) than bismuth(I). Because of spin-orbit coupling, flerovium may display closed-shell or noble gas-like properties; if this is the case, moscovium will likely be typically monovalent as a result, since the cation Mc+ will have the same electron configuration as flerovium, perhaps giving moscovium some alkali metal character. However, the Mc3+ cation would behave like its true lighter homolog Bi3+. The 7s electrons are too stabilized to be able to contribute chemically and hence the +5 state should be impossible and moscovium may be considered to have only three valence electrons. Moscovium would be quite a reactive metal, with a standard reduction potential of −1.5 V for the Mc+/Mc couple. The chemistry of moscovium in aqueous solution should essentially be that of the Mc+ and Mc3+ ions. The former should be easily hydrolyzed and not be easily complexed with halides, cyanide, and ammonia. Moscovium(I) hydroxide (McOH), carbonate (Mc2CO3), oxalate (Mc2C2O4), and fluoride (McF) should be soluble in water; the sulfide (Mc2S) should be insoluble; and the chloride (McCl), bromide (McBr), iodide (McI), and thiocyanate (McSCN) should be only slightly soluble, so that adding excess hydrochloric acid would not noticeably affect the solubility of moscovium(I) chloride. Mc3+ should be about as stable as Tl3+ and hence should also be an important part of moscovium chemistry, although its closest homolog among the elements should be its lighter congener Bi3+. Moscovium(III) fluoride (McF3) and thiozonide (McS3) should be insoluble in water, similar to the corresponding bismuth compounds, while moscovium(III) chloride (McCl3), bromide (McBr3), and iodide (McI3) should be readily soluble and easily hydrolyzed to form oxyhalides such as McOCl and McOBr, again analogous to bismuth. Both moscovium(I) and moscovium(III) should be common oxidation states and their relative stability should depend greatly on what they are complexed with and the likelihood of hydrolysis. 5), the Mc–Mc bond length is expected to be expanded from the extrapolated value of 156–158 pm to 329 pm due to spin–orbit coupling effects. Unambiguous determination of the chemical characteristics of moscovium has yet to have been established. In 2011, experiments were conducted to create nihonium, flerovium, and moscovium isotopes in the reactions between calcium-48 projectiles and targets of americium-243 and plutonium-244. However, the targets included lead and bismuth impurities and hence some isotopes of bismuth and polonium were generated in nucleon transfer reactions. This, while an unforeseen complication, could give information that would help in the future chemical investigation of the heavier homologs of bismuth and polonium, which are respectively moscovium and livermorium. The produced nuclides bismuth-213 and polonium-212m were transported as the hydrides 213BiH3 and 212mPoH2 at 850 °C through a quartz wool filter unit held with tantalum, showing that these hydrides were surprisingly thermally stable, although their heavier congeners McH3 and LvH2 would be expected to be less thermally stable from simple extrapolation of periodic trends in the p-block. Further calculations on the stability and electronic structure of BiH3, McH3, PoH2, and LvH2 are needed before chemical investigations take place. However, moscovium and livermorium are expected to be volatile enough as pure elements for them to be chemically investigated in the near future. The moscovium isotopes 288Mc, 289Mc, and 290Mc may be chemically investigated with current methods, although their short half-lives would make this challenging. Moscovium is the heaviest element that has known isotopes that are long-lived enough for chemical experimentation. ^ a b c d e f g h i j k l m Hoffman, Darleane C.; Lee, Diana M.; Pershina, Valeria (2006). "Transactinides and the future elements". In Morss; Edelstein, Norman M.; Fuger, Jean (eds.). The Chemistry of the Actinide and Transactinide Elements (3rd ed.). Dordrecht, The Netherlands: Springer Science+Business Media. ISBN 1-4020-3555-1. ^ a b c d e f g h i j k l m n o p q r s t u v Fricke, Burkhard (1975). "Superheavy elements: a prediction of their chemical and physical properties". Recent Impact of Physics on Inorganic Chemistry. 21: 89–144. doi:10.1007/BFb0116498. Retrieved 4 October 2013. ^ a b c d Oganessian, Yuri Ts. ; Abdullin, F. Sh. ; Bailey, P. D.; et al. (2010-04-09). "Synthesis of a New Element with Atomic Number Z=117". Physical Review Letters. American Physical Society. 104 (142502). Bibcode:2010PhRvL.104n2502O. doi:10.1103/PhysRevLett.104.142502. PMID 20481935. ^ Staff (30 November 2016). "IUPAC Announces the Names of the Elements 113, 115, 117, and 118". IUPAC. Retrieved 1 December 2016. ^ St. Fleur, Nicholas (1 December 2016). "Four New Names Officially Added to the Periodic Table of Elements". New York Times. Retrieved 1 December 2016. ^ a b "IUPAC Is Naming The Four New Elements Nihonium, Moscovium, Tennessine, And Oganesson". IUPAC. 2016-06-08. Retrieved 2016-06-08. ^ Oganessian, Y.T. (2015). "Super-heavy element research". Reports on Progress in Physics. 78 (3): 036301. doi:10.1088/0034-4885/78/3/036301. ^ Oganessian, Yu. Ts. ; Utyonkoy, V. K.; Lobanov, Yu. V.; et al. (2004). "Experiments on the synthesis of element 115 in the reaction 243Am(48Ca,xn)291−x115". Physical Review C. 69 (2): 021601. Bibcode:2004PhRvC..69b1601O. doi:10.1103/PhysRevC.69.021601. ^ Oganessian; et al. (2003). "Experiments on the synthesis of element 115 in the reaction 243Am(48Ca,xn)291−x115" (PDF). JINR preprints. ^ Oganessian, Yu. Ts. ; Utyonkov, V.; Dmitriev, S.; Lobanov, Yu. ; Itkis, M.; Polyakov, A.; Tsyganov, Yu. ; Mezentsev, A.; Yeremin, A.; Voinov, A. A.; et al. (2005). "Synthesis of elements 115 and 113 in the reaction 243Am + 48Ca". Physical Review C. 72 (3): 034611. Bibcode:2005PhRvC..72c4611O. doi:10.1103/PhysRevC.72.034611. ^ a b c Barber, Robert C.; Karol, Paul J; Nakahara, Hiromichi; Vardaci, Emanuele; Vogt, Erich W. (2011). "Discovery of the elements with atomic numbers greater than or equal to 113 (IUPAC Technical Report)". Pure Appl. Chem. 83 (7): 1485. doi:10.1351/PAC-REP-10-05-01. ^ "Study of heavy and superheavy nuclei (see project 1.5)". Flerov Laboratory of Nuclear Reactions. ^ "FLNR Scientific Programme: Year 2017". flerovlab.jinr.ru. JINR. 2017. Retrieved 21 September 2017. ^ Nuclear Physics European Collaboration Committee (2017). "NuPECC Long Range Plan 2017 Perspectives in Nuclear Physics" (PDF). www.esf.org. European Science Foundation. Retrieved 9 January 2018. The new building is ready for installation of the DC-280 cyclotron, the commissioning and testing of the accelerator are ongoing, and the first experiments should begin in 2018. ... The synthesis of isotopes of element Z=115 in the 48Ca+243Am reactions was chosen as the first-day full-scale experiment. During this experiment, the performances of all the systems of the new accelerator and gas-filled separator (GFS-2) will be tested. ... To get access to superheavy nuclides with Z>118 and carry out a detailed study on their properties, a sufficient increase in the beam intensity and the development of separators that provide the necessary background suppression are needed. This is the main goal of the construction of a first-ever SHE Factory. ^ "Existence of new element confirmed". Lund University. 27 August 2013. Retrieved 10 April 2016. ^ "Spectroscopy of element 115 decay chains (Accepted for publication on Physical Review Letters on 9 August 2013)". Retrieved 2 September 2013. ^ a b Karol, Paul J.; Barber, Robert C.; Sherrill, Bradley M.; Vardaci, Emanuele; Yamazaki, Toshimitsu (22 December 2015). "Discovery of the elements with atomic numbers Z = 113, 115 and 117 (IUPAC Technical Report)" (PDF). Pure Appl. Chem. 88 (1–2): 139–153. doi:10.1515/pac-2015-0502. Retrieved 2 April 2016. ^ Gates, J. M; Gregorich, K. E; Gothe, O. R; Uribe, E. C; Pang, G. K; Bleuel, D. L; Block, M; Clark, R. M; Campbell, C. M; Crawford, H. L; Cromaz, M; Di Nitto, A; Düllmann, Ch. E; Esker, N. E; Fahlander, C; Fallon, P; Farjadi, R. M; Forsberg, U; Khuyagbaatar, J; Loveland, W; MacChiavelli, A. O; May, E. M; Mudder, P. R; Olive, D. T; Rice, A. C; Rissanen, J; Rudolph, D; Sarmiento, L. G; Shusterman, J. A; et al. (2015). "Decay spectroscopy of element 115 daughters: 280Rg→276Mt and 276Mt→Bh". Physical Review C. 92 (2). Bibcode:2015PhRvC..92b1301G. doi:10.1103/PhysRevC.92.021301. ^ Forsberg, U.; Rudolph, D.; Fahlander, C.; Golubev, P.; Sarmiento, L. G.; Åberg, S.; Block, M.; Düllmann, Ch. E.; Heßberger, F. P.; Kratz, J. V.; Yakushev, A. (9 July 2016). "A new assessment of the alleged link between element 115 and element 117 decay chains" (PDF). Physics Letters B. 760 (2016): 293–6. Bibcode:2016PhLB..760..293F. doi:10.1016/j.physletb.2016.07.008. Retrieved 2 April 2016. ^ Forsberg, Ulrika; Fahlander, Claes; Rudolph, Dirk (2016). Congruence of decay chains of elements 113, 115, and 117 (PDF). Nobel Symposium NS160 – Chemistry and Physics of Heavy and Superheavy Elements. doi:10.1051/epjconf/201613102003. ^ Zlokazov, V. B.; Utyonkov, V. K. (8 June 2017). "Analysis of decay chains of superheavy nuclei produced in the 249Bk+48Ca and 243Am+48Ca reactions". Journal of Physics G: Nuclear and Particle Physics. 44 (75107): 075107. Bibcode:2017JPhG...44g5107Z. doi:10.1088/1361-6471/aa7293. Retrieved 9 January 2018. ^ "IUPAC - International Union of Pure and Applied Chemistry: Discovery and Assignment of Elements with Atomic Numbers 113, 115, 117 and 118". ^ Koppenol, W. H. (2002). "Naming of new elements (IUPAC Recommendations 2002)" (PDF). Pure and Applied Chemistry. 74 (5): 787. doi:10.1351/pac200274050787. ^ "115-ый элемент Унунпентиум может появиться в таблице Менделеева". oane.ws (in Russian). 28 August 2013. Retrieved 23 September 2015. В свою очередь, российские физики предлагают свой вариант – ланжевений (Ln) в честь известного французского физика-теоретика прошлого столетия Ланжевена. ^ Fedorova, Vera (30 March 2011). "Весенняя сессия Комитета полномочных представителей ОИЯИ". JINR (in Russian). Joint Institute for Nuclear Research. Retrieved 22 September 2015. ^ Zavyalova, Victoria (25 August 2015). "Element 115, in Moscow's name". Russia & India Report. Retrieved 22 September 2015. ^ Lutetium, with its original spelling lutecium, is named after Lutecia, the predecessor of present-day city of Paris. ^ Fedorova, Vera (3 March 2017). "At the inauguration ceremony of the new elements of the Periodic table of D.I. Mendeleev". jinr.ru. Joint Institute for Nuclear Research. Retrieved 4 February 2018. ^ a b c d e f Zagrebaev, Valeriy; Karpov, Alexander; Greiner, Walter (2013). "Future of superheavy element research: Which nuclei could be synthesized within the next few years?" (PDF). Journal of Physics: Conference Series. 420. IOP Science. pp. 1–15. Retrieved 20 August 2013. ^ a b c Thayer, John S. (2010). "Relativistic Effects and the Chemistry of the Heavier Main Group Elements". Relativistic Methods for Chemists. Springer. pp. 63–67, 83. doi:10.1007/978-1-4020-9975-5_2. ISBN 978-1-4020-9974-8. ^ Zaitsevskii, A.; van Wüllen, C.; Rusakov, A.; Titov, A. (September 2007). "Relativistic DFT and ab initio calculations on the seventh-row superheavy elements: E113 - E114" (PDF). jinr.ru. Retrieved 17 February 2018. ^ Keller, O. L., Jr.; C. W. Nestor, Jr. (1974). "Predicted properties of the superheavy elements. III. Element 115, Eka-bismuth" (PDF). Journal of Physical Chemistry. 78 (19): 1945. doi:10.1021/j100612a015. ^ Santiago, Régis T.; Haiduke, Roberto L. A. (2018). "Relativistic effects on inversion barriers of pyramidal group 15 hydrides". International Journal of Quantum Chemistry: e25585. doi:10.1002/qua.25585. 5 (M = N, P, As, Sb, Bi, Mc) Clusters". Journal of Computational Chemistry. 2018 (14): 862. doi:10.1002/jcc.25170. ^ a b c d Eichler, Robert (2013). "First foot prints of chemistry on the shore of the Island of Superheavy Elements" (PDF). Journal of Physics: Conference Series. IOP Science. 420 (1): 012003. arXiv:1212.4292. Bibcode:2013JPhCS.420a2003E. doi:10.1088/1742-6596/420/1/012003. Retrieved 11 September 2014.